Called to stand with God for His purposes for Jerusalem, Tom Hess has lived on the peak of the Mount of Olives since 1987 at the Golden Gate House of Prayer with the most direct view possible of the Golden Gate and the Temple Mount. He is the pastor of the Jerusalem House of Prayer for All Nations and pastoral gatekeeper of the Golden Gate and the Bethany–Bethphage Gate, contributing to both the 24-hour Watch at the Jerusalem House of Prayer for All Nations, the Jerusalem Watch of the King, and the World Wide Watch. He is the president of the All Nations Convocation Jerusalem and Progressive Vision Publishing. Tom Hess is the author of numerous books presenting an authentic view of issues surrounding Israel, Jerusalem, and the Middle East. 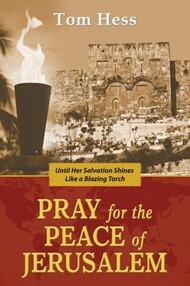 Topics include God’s covenants with the people and land of Israel, reconciliation of Jews and Arabs, aliyah, and prayer. Tom also travels the world sharing God’s heart for the covenant land and the covenant people while encouraging new 24-hour watches to be birthed.